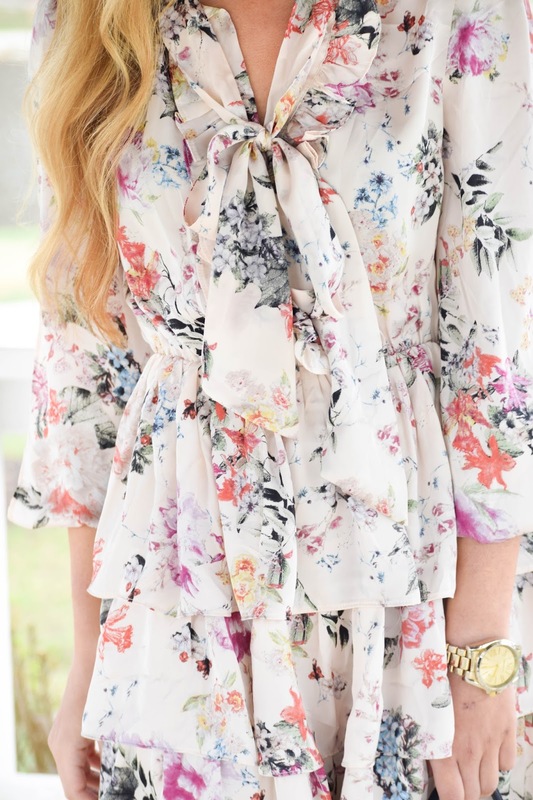 This dress is spring elegance at its finest. 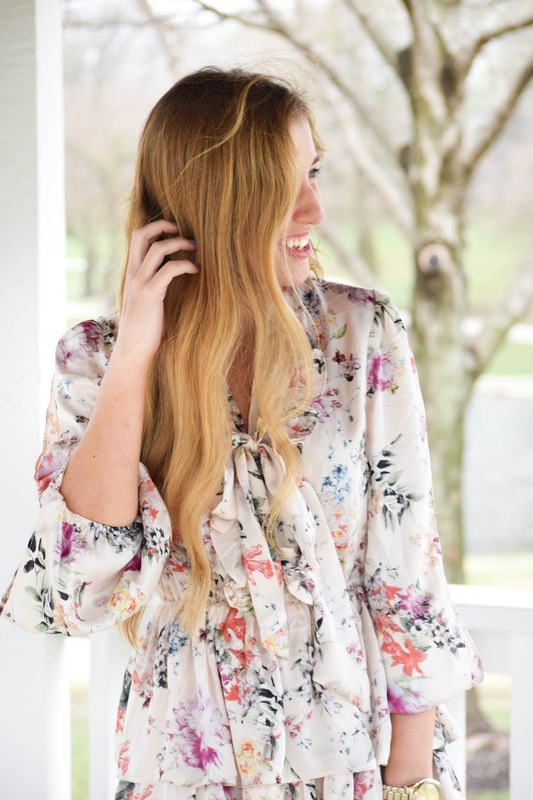 If you're looking for a dress for a spring wedding or formal event, look no further than this silky little number. 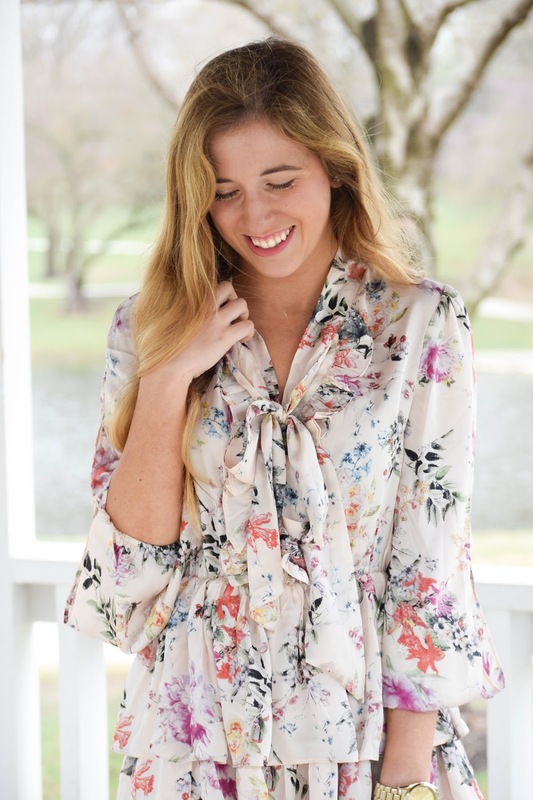 This dress is decked out in frivolous details from the billowing sleeves to the tiered bottom to the necktie and ruffled neckline, and when they're all put together so beautifully like in this dress I couldn't help but fall in love! It's a darling showstopper and a perfect dress option now that wedding season is in full swing! Since the dress is very busy in and of itself, I kept the jewelry and shoes as simple as possible, but I opted for an unexpected pop of navy with my large Tory Burch tote. I think it helps break up the pattern and pull out the blues in the floral. How was everyone's weekend? The weather where I was was depressing. I went to the lake for a fraternity formal, and it rained the entire time. It was a bummer not being able to be outside much and enjoy where we were, but we made the best of it! Although, it's May, so I would really appreciate the warm weather to come back ASAP! such a pretty dress , I love it !